The first Christmas babies spend with their families is a special occasion, and you may want to commemorate the event with an ornament. There are many options from which to select to help you find just the perfect ornament. One way to narrow the choices is to look to brand manufacturers with established reputations so you know that your baby's first ornament will be a precious keepsake. In this 2016 Disney's Baby's 1st Winnie the Pooh Ornament by Lenox, Winnie the Pooh is riding off to dreamland on his rocking horse in this officially licensed ornament. This is less than five inches and is a 2014 limited edition featuring a gold hanging cord and a gold inscription. At around $30, it makes a thoughtful gift that will be treasured for many holidays. Add some whimsy to the holiday tree with this Personalized Baby's 1st Christmas Blue Elephant Ornament. This delightful baby elephant is adorably bespeckled with blue polka dots and golden toenails. The ornament features a tasselled hanging cord and the words "Baby's 1st Christmas" on one side of the porcelain bow. Personalize the other side of the bow with a baby boy's birth year and name to create a keepsake ornament for around $30. Customer reviewers were all satisfied with the ornament's good looks and perfect personalization and mentioned it made an excellent baby shower or christening gift as well. Customer purchases of $70 or more ship free. If you register your Lenox items in the Breakage Replacement Program and you break a piece, you can replace it for 50 percent of the retail price of in-stock items. You have 30 days to return unwanted items. Hallmark.com's online selection of ornaments celebrating a first Christmas for an infant is small but what it lacks in quantity it makes up for in quality and uniqueness. Browse styles like baby's first Christmas handprint, baby's first reindeer, grandbaby's first Christmas and more. Prices are in an affordable $12 to $20 range. Baby's First Christmas Stocking features an adorable bear cub nestled among stars and tucked into a Christmas stocking. The ornament is marked with "2014" and "Baby's First Christmas" to create a lasting memory for the recipient. It retails for around $20. With a little dash of time and basic skills, you can create a lifelong memorial to a first Christmas for baby with this Baby's First Christmas Handprint Ornament Kit. The ornament kit contains all the necessary supplies and instructions for making a 5 x 6 x 3.75 mold of that precious, tiny handprint. Finish it off with the red hanging ribbon and hang it on the tree for Christmas and then on the wall as a lasting reminder of the first of many happy holidays with baby. At under $12, you'll be hard-pressed to find a less expensive way to honor the newest member of the family. You can purchase online and ship free to the store, but if you want it shipped to your home, there may be a fee. Also, Hallmark offers a 90-day return policy. Bronner's Christmas Wonderland carries a nicely balanced inventory of gender-specific and gender-neutral ornaments that commemorate that first Christmas for baby. Prices are quite affordable and range from under $5 to around $25. Popular styles include the following. You'll be proud to give or receive this Baby Girl With Buggy First Christmas Glass Ornament. 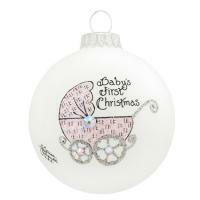 This designer original ornament celebrates a baby girl's first Christmas. The white glass globe is encrusted with sparkling Swarovski crystals to catch and reflect the Christmas tree lights, and it's emblazoned with the inscription, "Baby's First Christmas." Expect to pay around $20 for this unique piece. Bronner's offers their customers a generous 90-day return policy. Shipping costs are based upon the dollar amount of purchases. Perfect for either gender, the Radko Rocking Baby's First Christmas Ornament features a shimmering rocking horse with Christmas gifts piled on its saddle. 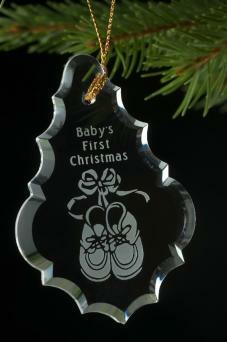 Gold lettering spells out Baby's 1st Christmas, and you can add a custom message to the ornament for a small fee. It is a definite statement-making ornament that will attract attention while broadcasting the joyous news of a first Christmas for a new arrival. It comes with a free gift box and retails for around $40. Receive a free ornament when your purchases total over $300; shipping is free within the continental U.S. with orders greater than $75. The Christopher Radko Gallery has a 10-day return policy. Storing your ornaments properly keeps them from breaking and chipping so you can enjoy decorating with them for years to come. There are storage boxes specifically designed to store and protect Christmas ornaments or you can create one. You'll need a sturdy box and lots of tissue paper or bubble wrap. Wrap the ornaments carefully in the protective material and pack them into the box. If there are empty spaces in the box when you are finished, fill in the spaces with packaging peanuts to keep the ornaments from shifting around when the box is moved, which could cause breakage. You can also store your ornaments in the original packaging if you prefer. No matter how you decide to store them from season to season, you'll want to take care to protect your precious treasures commemorating your children's first Christmas holiday.